Rebecca Baron is a filmmaker, curator and educator based in Los Angeles. 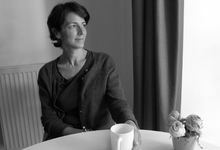 She is best known for her essay films that explore the changing nature of image-making and the construction of history. She is particularly interested in the politics of archives and in still photography's relationship to the moving image. In collaboration with Doug Goodwin, she has most recently been investigating the roles and vicissitudes of AI, machine learning and database design in relation to cinematic expression. Her award-winning films have screened widely at international film festivals and media venues including Documenta 12, New York Film Festival, the British Film Institute, Centre Pompidou, Anthology Film Archive, Toronto Film Festival, London Film Festival, Viennale, Pacific Film Archive, Flaherty Film Seminar and the Whitney Museum of American Art. Major grants and fellowships include a 2002 Guggenheim Fellowship, a 2007 Fellowship at the Radcliffe Institute for Advanced Study, and a City of Paris Artist Fellowship. In 2010, the Austrian Film Museum presented a retrospective of her work. Her most recent film Detour de Force was awarded Best Experimental Film at Ann Arbor Film Festival and the festival prize at l'Age d'Or Film Festival. Rebecca is co-curator of @SEA, a multi-disciplinary program at the Poetic Research Bureau in Los Angeles. Rebecca has been on the faculty of California Institute of the Arts School of Film/Video since 2000. She has also taught documentary and experimental film at Massachusetts College of Art, Harvard University and EICTV Cuba.